It was my first time but definitely not the last one! Two weeks ago I came back from the International Garden Centre Association trip to Niagara Falls, Canada. With a group of over 200 people from all over the world, we enjoyed the trip through the garden industry in this part of Ontario. Since I was travelling around in a bus with a group of about 20 youngsters from the industry it was very relaxed and entertaining, and we even learned something while having fun! Here are 3 online marketing tips that I learned about in Canada. You can apply these yourself into your own centre. And at the end of this newsletter, I have included a link to check out that will provide you with much more inspiration for your garden centre! Monday morning started off at 8 am with an inspiring presentation about Amazon and Blue Apron (like Hello Fresh delivering meal boxes in the US). And it was spot on! A box, home delivery, recipes and a bunch of carrots aren’t really innovating. But if you combine them you'll create a solution rather than a selection of products. And that’s exactly what younger customers are expecting. They want to have a garden but don’t want to do the gardening. And we would like to cook, but preferably without using our brains. A lot of opportunities. How about a webshop with ready-to-use products like pot/plant combination. Let Amazon sell products, you’d better focus on solutions. Life was tough in Canada. 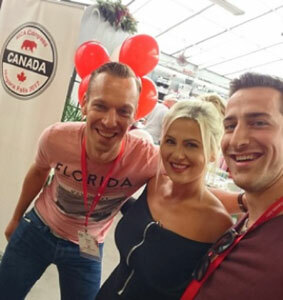 At each garden centre, we visited we had to conduct an interview with one of the owners to learn more about their ambitions, challenges and successess. I also had to do one together with Franco, a marketer of Garden Centre Maier in Switzerland, I had the honour to interview one of family members of Holland Park Garden Gallery. Quite remarkable because she wasn’t an older man but a former Miss Teen Canada (and that isn’t a joke!). Anyways, apart from her looks, both she and her mother had some very bright ideas. They plan to start selling front gardens via their webshop. They designed three gardens fitting into the most common gardens in their surroundings. And they plan not just to sell the gardens in a DIY package but they also offer to do the landscaping as well. Apart from that they started to specialise in decorations for weddings which worked really well. A great combination of solutions, online marketing & offline services! At Terra Greenhouses they are using a lot of videos. They noticed they are able to generate a lot of exposure via YouTube among their customers. They got two types of video’s which should be appealing to different audiences. One in a more traditional style showing how-to’s: how to plant a container or how to care for your lawn. The other one is a vlog in which a young lady is maintaining her garden. The funny part of the latter: she also includes the mistakes she’s making. I rarely see mistakes happening on TV, so this is way more recognizable for the younger audience! Apart from these online marketing tips a lot of topics have been discussed including succession (nothing to worry about for me! ), catering (and how annoying chefs can be) and staff management. In other words, it was an overall very useful trip and I suggest you go to the website of the 2018 congress which will be held next year in Prague: check it out. Last but not least: thanks for reading my blog. I know it’s your monthly struggle so to thank you, have a look at the photos I posted on our Facebook Group. Wanna learn more about How To Grow Your Own Pizza? Have a look and enjoy! See you at the HTA Marketing Forum on the 15th of November! Go to www.gardenconnect.com if you want to learn more about online marketing for your garden centre.